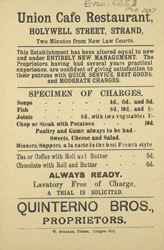 The late-19th century's many cafés and restaurants all competed with one another to provide the cheapest and tastiest meals for the working population. Men often worked considerable distances from their homes and so could not return for their midday meal. Some men took cold food with them such as pasties and pies, but those who could afford it ate in cheap cafés and restaurants. To attract diners this café owner is advertising free use of the lavatory - at this time a fitted toilet would have been rare outside high-class hotels and function halls.